The Church of Sant Bartolomeu & St. Tecla, an icon in Sitges. Sitges is a small coastal town situated 34 kilometers southwest of Barcelona (map). The beaches are the main attraction but I highly recommend spending at least a few days there as there are a lot more things to do in Sitges. Aside from the beaches, there are Art Nouveau buildings, picturesque lanes, centuries-old festivals, museums and a plethora of restaurants, cafés and bars. This is what most visitors come to Sitges for. The beaches are a 10-minute walk from the train station and extend for several kilometers, separated every few hundred meters by dykes that help to protect the beaches. You can bring your own towel and lie on the soft sand or you can hire a deck-chair/umbrella on the beach. Families tend to head to the eastern beaches (closer to Sant Bartomeu/Tecla church) and Sant Sebastia beach, and the western sections (Beso Beach). There’s a gay beach opposite Pic Nic restaurant (also a lovely restaurant for a seafood lunch). 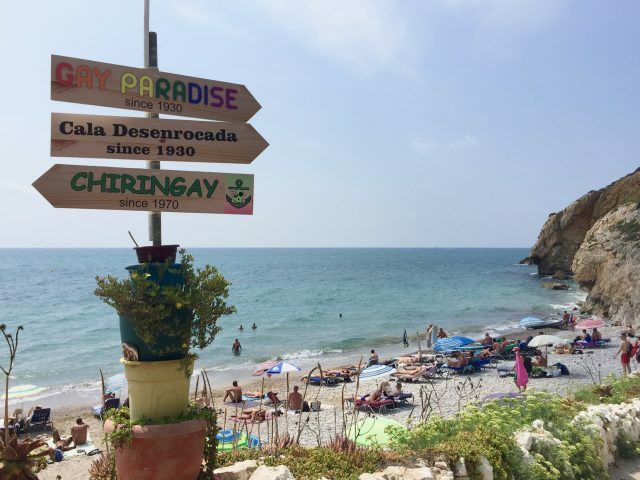 There’s also a clothing-optional beach right in the town at Playa de las Balmins (east of Sant Sebastia beach, past the Vivero Beach Club) and another in the far west called Playa del Muerto (about a one-hour walk/hike from the town centre). Having said that, the beaches are all very mixed, with locals, visitors, families, singles, couples, young and older spread out across the entire coast. If you’re thirsty or hungry, a beach kiosk or restaurant is never far away. At some beaches, you can also hire a kayak or SUP board. The Sitges beach promenade extends several kilometers from the Sant Bartomeu/Tecla church to the Sunway Hotel/Golf. Aside from some street vendors, beach kiosks and restaurants, the promenade is wide open for pedestrians, joggers, cyclists and skate-boarders. The promenade is perfect for a leisurely stroll to enjoy the view of the beaches and the sea, and it’s also a great place to sit and people-watch. As you stroll away from the town centre, notice the beautiful villas that line the road (Passeig Maritim). The promenade stretches for several kilometers. The promenades starts (or ends) at the foot of the Church of St. Bartolmeu & St. Tecla. There are no less than seven museums in Sitges, many of which have interiors that are just as fascinating as the artifacts they house. 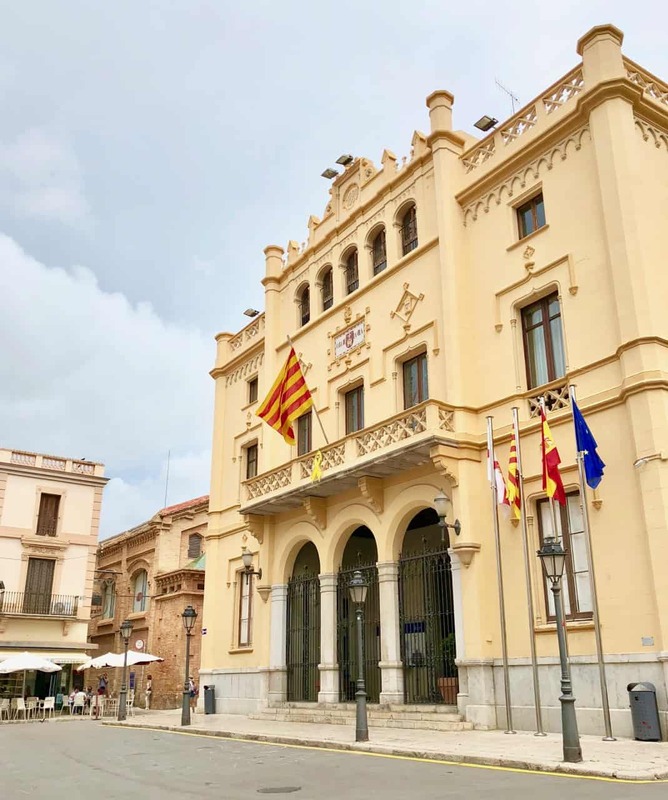 Of these museums, my favourite is the Cau Ferrat Museum, with its stunning blue (a tone of blue called Sitges Blue) interior and private art collection, including lesser-known Picasso’s and El Greco’s. Next door, you’ll find the Maricel Museum, the highlight of which is a gallery with beautiful views of the sea. At the entrance, you can purchase one ticket for both museums. The beautiful Cau Ferrat Museum. Sketching by Picasso at the Cau Ferrat Museum. The first floor of the Cau Ferrat Museum. Maricel Museum – gallery with a view of the Mediterranean Sea. 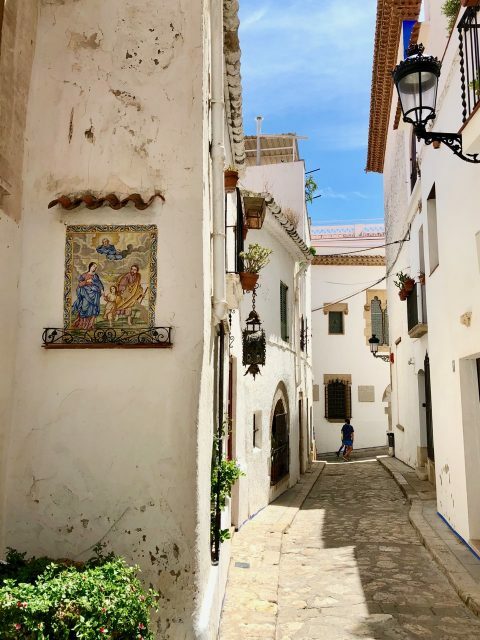 Other noteworthy museums include the neo-classical Can Llopis Romantic Museum and the Casa Bacardi Sitges (Sitges is the birth town of Don Facundo Bacardí Massó, the founder of the world-famous rum brand). The historic town centre is a jumble of streets and lanes lined with houses, shops, restaurants and bars. Wander along the cobblestone lanes, away from the busy tourist streets, and discover gorgeous houses, grand monuments and architectural gems. You’ll come across a variety of styles, from neo-classical to Gothic and Modernist (Art Nouveau). A quiet lane in Sitges. 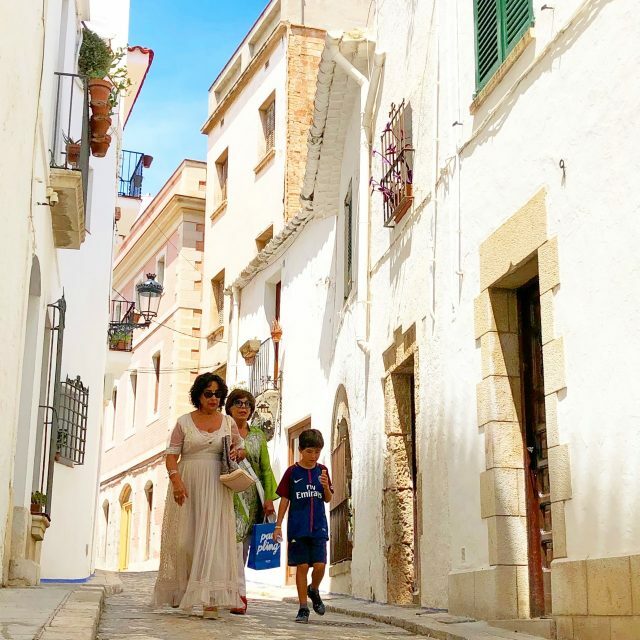 A stroll around the maze of streets and lanes of Sitges historic centre is a joy! For the architecture lovers, you can follow a Modernist route that features the work of Santiago Rusiñol as well as homes of the ‘Americanos’ (Sitges folk who made their riches in the Spanish colonies and returned to Sitges). From the train station, head down Calle Illa de Cuba and Calle Francesc Gumà. 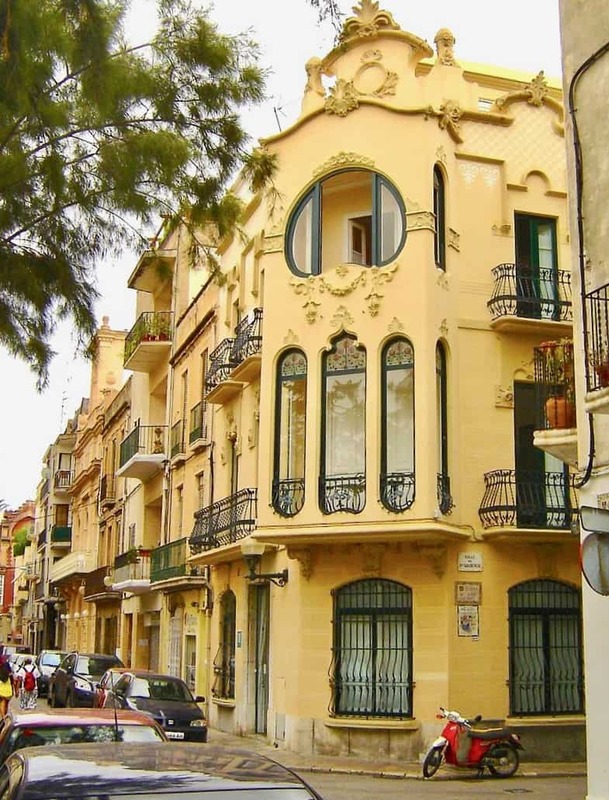 You’ll find various Modernist examples along these streets, such as Can Bonaventura Blay (Hotel El Xalet), Casa Manuel Planas and Casa Pere Carreras. Casa Manuel Planas (image courtesy of Nakhon100). Continue towards Plaça Cap de la Vila (square) where you’ll find one of my favourite buildings in Sitges: the Can Bartomeu Carbonell. Can Bartomeu Carbonell with its beautiful clock tower. From here, walk towards the Town Hall where you’ll find some neo-Gothic and Modernist examples. End your walk at the Can Ferrat Museum. The former house of Santiago Rusiñol, the blue interior is striking and there are many works by the likes of El Greco, Picasso and Rusiñol himself. Join a guided tour (by a local historian) along this Modernist route. The tour also includes wine and tapas tastings. Sitges is home to a big variety of religious, cultural and music festivals that take place throughout the year. 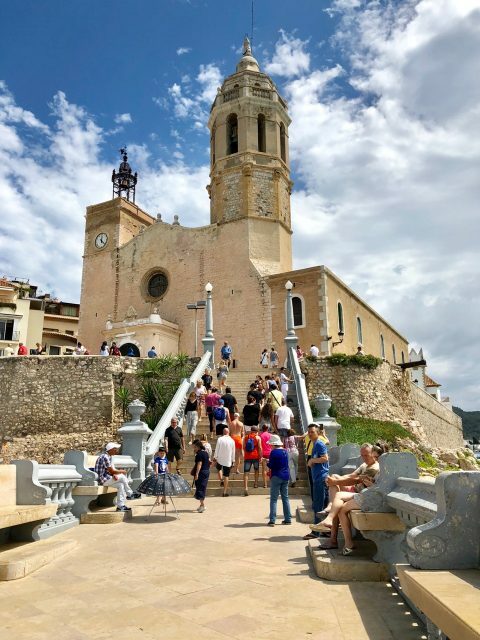 The biggest of the religious festivals is the Feast of Sant Bartomeu (or Festa Major de Sitges), the patron saint of Sitges, which takes place in August. Other big parties and festivals include the Sitges Carnival (usually in February), Gay Pride (June), Corpus Festival (flower carpet festival in June) and the Sitges International Film Festival (October). The hills which surround Sitges extend directly to the sea to the west of Sitges, offering great hiking opportunities along shrubby slopes and pine tree forests. Steep inclines lead down to sheltered coves, some with secluded pebble beaches. One of the most popular clothing-optional beaches, Playa del Muerto, can be found here. To get there, walk the entire length of the Sitges promenade in the direction of the Sunway Hotel/golf course, pass the golf course and head into the hills (hike parallel to the train tracks). The hikes offer beautiful views of the rugged coastline and the crystal-clear water in the coves below. The rugged coastline (south)west of Sitges. Despite its small size, Sitges has a very cosmopolitan culture, which is also reflected in the variety of cuisines available. From local Catalan cuisine to Italian, Japanese, Indian, French, Portuguese, etc.. visitors have lots to choose from. For local seafood specialties, head to Restaurante Pescadito (Carrer Marquès Montroig, 4) or the Club Nautic de Sitges. Try Fragata or Alfresco for a delicious fine-dining experience. Other restaurants I can recommend include Costa Dorada, Bistro D’ana, LaPunta and Restaurante La Incidencia Del Factor Vi. Jamon iberico and calamari rings at Pic Nic. 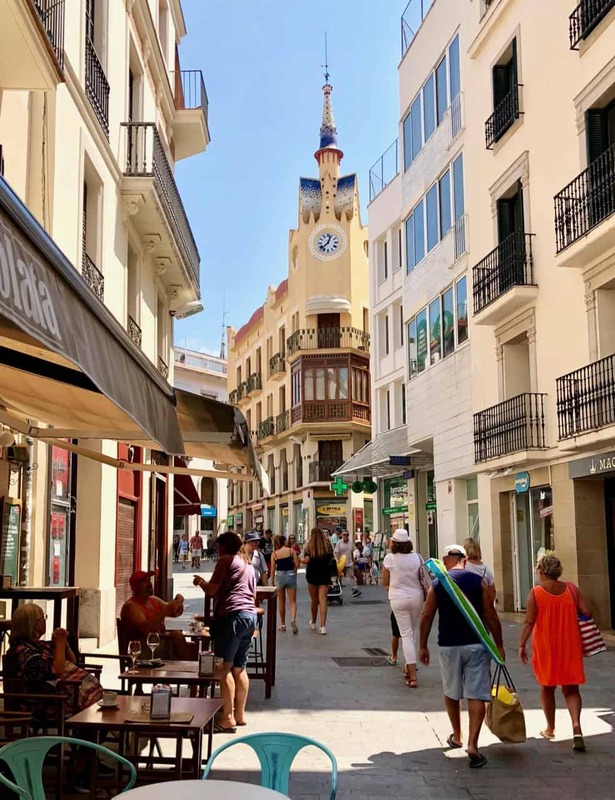 Sitges is one of the gay capitals of Europe, with a vibrant gay scene that goes into overdrive twice a year: during Gay Pride in June and Bears Week in September. Many of the gay bars, restaurants and hotels are located in the ‘gay village’. In the heart of the village is the Plaça Industria (the intersection of Carrer de Joan Tarrida and Carrer Marquès Montroig). There are terraces at all four corners of this square. Choose a spot, especially during happy hour, and enjoy the people-watching! You’ll soon notice that it’s one of the locals’ favourite pastimes too! Sitges is easily accessible by public transport from Barcelona and Barcelona Airport. By car, Sitges is about a 45/30-minute drive from Barcelona/Barcelona Airport. If you arrive at Barcelona Airport T2, take the C2 RENFE train to El Prat de Llobregat which is the first stop after the airport. You can then catch a train to Sitges from this station. If you are arriving at Barcelona Airport T1, the easiest way to get to Sitges is to hop on the MonBus – if you decide to take the MonBus, I suggest buying a card for 10 journeys (±€27). You can use this card for travel to/from Sitges/Barcelona and/or use it for numerous persons (if you’re travelling in a group). In addition, there are frequent bus and train services from Barcelona to Sitges.